Please visit for complete details. 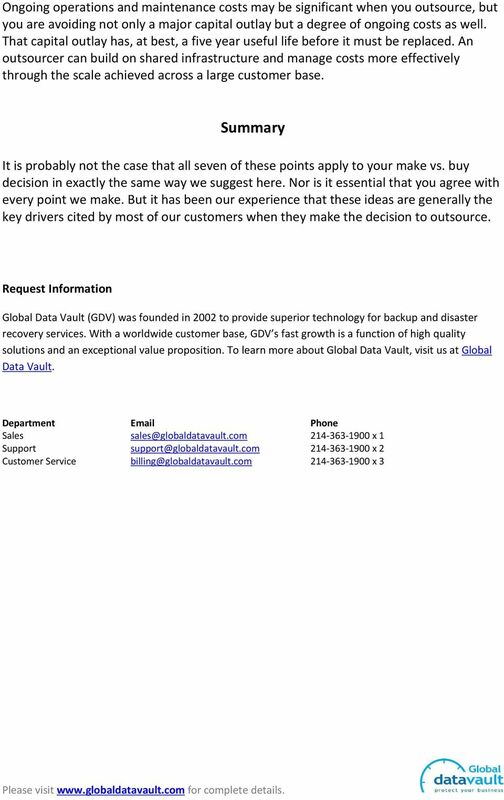 Download "Please visit www.globaldatavault.com for complete details." 3 temporary suspension of service in the event of regional power outages. It may also mean that the data itself can come into question, as appeared to be the case when Amazon reported at 10:36 PM PDT that Elastic Block Store storage volumes may have inconsistent data and in effect be Impaired. It seems reasonable to expect that when the next major earthquake hits the U. S. West Coast, we ll see extended data center outages there. Why does this matter? Because when internal teams build DR solutions they generally rely on trusted partners the same connectivity provider, for example, or the same data center operator. This practice does not achieve the same level of diversity of risk achieved through outsourcing. 2. Your infrastructure will fail. In spite of all the redundancy, things still go wrong. Complexity is ever increasing and with that comes more challenging management. Look at the recent massive data theft at Target and Neiman Marcus. Even Google has outages. Look at recent Gmail unplanned outages. These are all functions of ever increasing complexity not simple system or hardware failures. These were all in high end enterprise class infrastructures which were designed to survive component failures or malicious attacks. But still they failed. Your infrastructure might be better than all these companies, but it s still subject to the same problem: increasing complexity creates significant technology and management challenges. 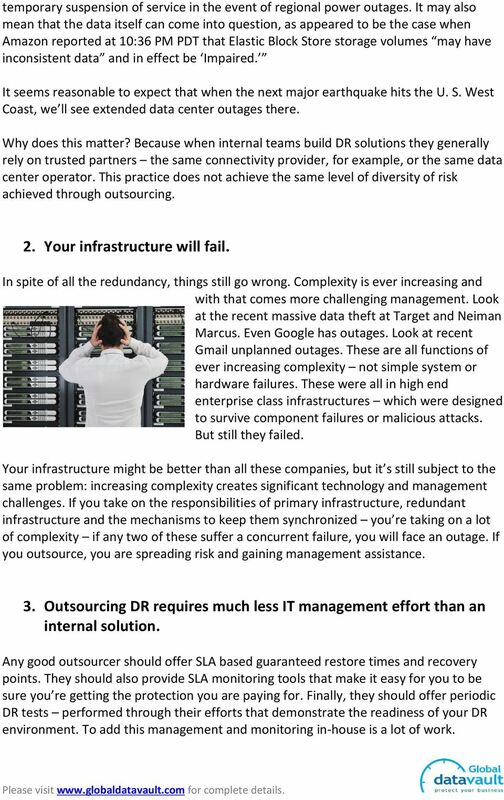 If you take on the responsibilities of primary infrastructure, redundant infrastructure and the mechanisms to keep them synchronized you re taking on a lot of complexity if any two of these suffer a concurrent failure, you will face an outage. If you outsource, you are spreading risk and gaining management assistance. 3. Outsourcing DR requires much less IT management effort than an internal solution. Any good outsourcer should offer SLA based guaranteed restore times and recovery points. They should also provide SLA monitoring tools that make it easy for you to be sure you re getting the protection you are paying for. Finally, they should offer periodic DR tests performed through their efforts that demonstrate the readiness of your DR environment. To add this management and monitoring in-house is a lot of work. 4 4. Outsourcing allows you to work with highly experienced DR specialists. Consider Microsoft Exchange we have been through hundreds or thousands of Exchange recoveries. We have specialized knowledge and specialized tools that have proven to crack the tough cases. Consider Windows Activation especially for Windows OEM licenses booted on new hardware do you know what to do when Microsoft says This copy of Windows does not appear to be genuine and it won t boot? We do. We have years of experience dealing with this. We can also tell you what not to do i.e. call Microsoft unless you d like to waste half a day in the middle of a crisis. 5. It s much easier for an outsourcer to give you true geographic diversity. 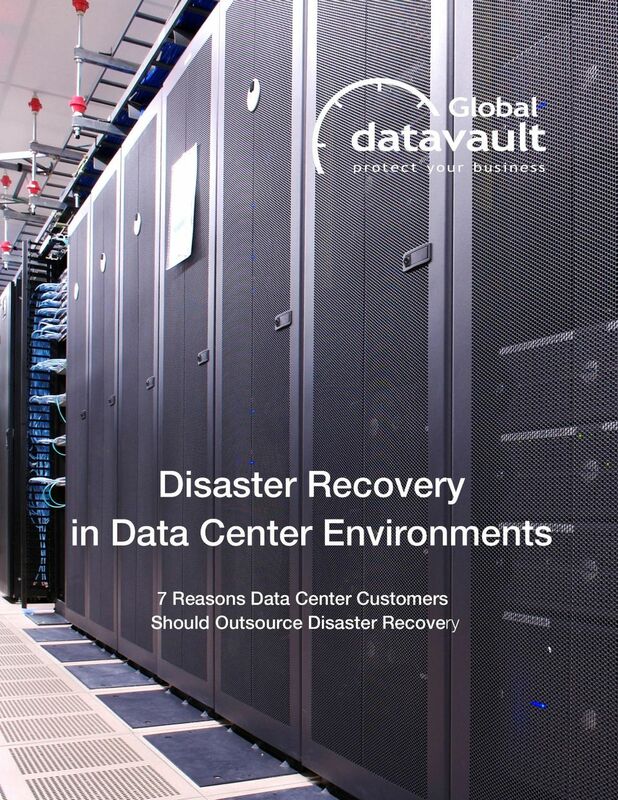 Any good provider should offer recovery from continent-wide storage locations thousands of miles apart. Even middle market companies struggle to manage infrastructure when it s so far flung. Remote hands are not the same as local hands, and eyes and ears. If you outsource, you gain valuable remote management assistance. 6. A major risk of an internal solution is the cost of under or over estimating scope. If you build too much DR infrastructure, you waste money. If you don t build enough capacity and have to expand you will likely not achieve the most cost effective solution because it s more cost effective to buy more capacity up front. An outsourcer absorbs this problem for you by achieving economy of scale across a large shared infrastructure serving a large customer base. 7. 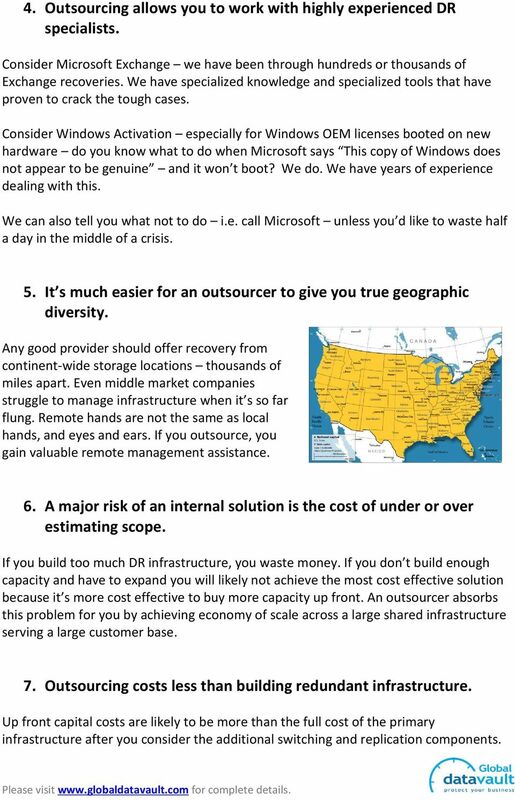 Outsourcing costs less than building redundant infrastructure. Up front capital costs are likely to be more than the full cost of the primary infrastructure after you consider the additional switching and replication components. 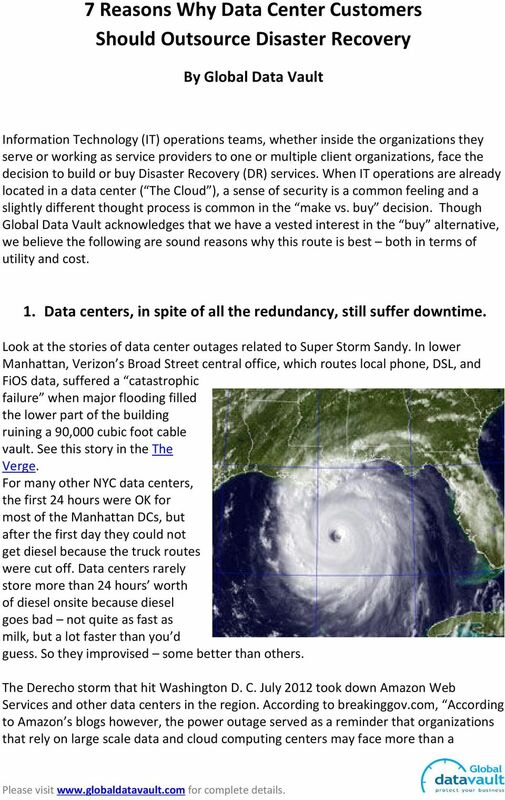 the Availability Digest Can You Trust the Compute Cloud? August 2008 Thousands of small to medium businesses (and some large ones as well) use Amazon.com s services to implement their online presences. Cloud Computing for Business. Is It Right For You? 5 Reasons Your Business Needs Network Monitoring Intivix.com (415) 543 1033 5 REASONS YOUR BUSINESS NEEDS NETWORK MONITORING Your business depends on the health of your network for office productivity. Is a Cloud ERP Solution Right for You? Stop Rewarding Your IT Provider When Your Systems Are Down! the Availability Digest Unix Backup and Recovery February 2007 Backing up is a pain. But it is the restore that counts. This is the message that Curtis Preston delivers in his book, Unix Backup and Recovery.